JUNE brought tangible signs of the Class 68 fleet being prepared for use on the upcoming TransPennine Express loco-hauled services. The early hours of June 13 found No. 68025 powering a short rake of Riviera air-conditioned Mk.2s on a fuel consumption trial for TPE. Running as the 5Z08/01.00 Crewe Down Refuge Siding-York Holgate, this travelled via Warrington, Manchester Piccadilly, Huddersfield and Leeds before returning as the 04.47 departure from York, this going via Victoria rather than Piccadilly. Meanwhile, Nos. 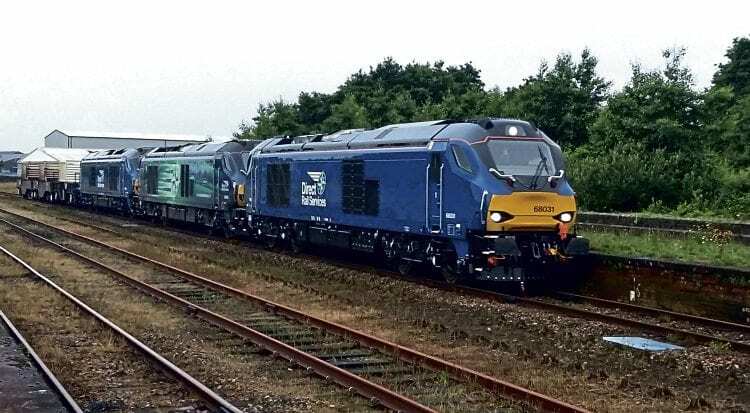 68019, 68020 and 68021 were transferred to the new XHTP pool at the start of June, this being for locos that will be used by TPE. The trio subsequently spent the month out of service at Gresty Bridge undergoing modifications in order to work with the new CAF loco-hauled stock. With commissioning completed, the latest four members of the class were all released into traffic from Crewe on June 21.